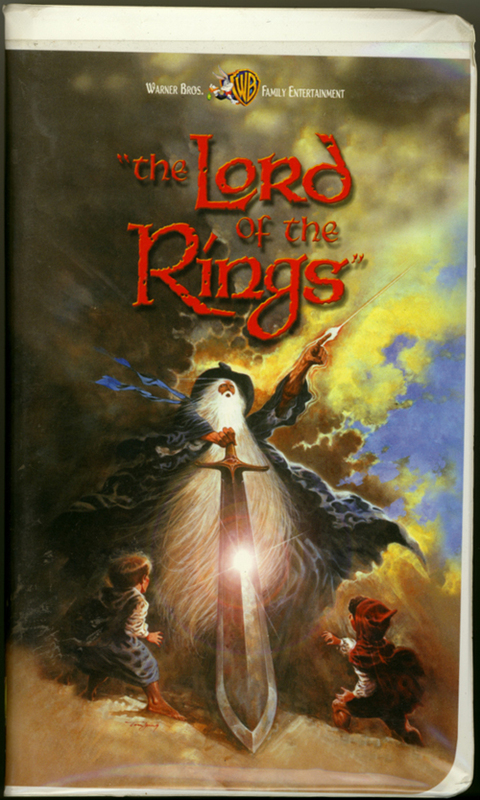 Lord of the Rings on VHS. Starring Christopher Guard, William Squire, Michael Scholes, John Hurt. Directed by Ralph Bakshi. From the novels “The Fellowship of the Ring” and “The Two Towers” by J.R.R. Tolkien. 1978. All the magical adventure of J.R.R. Tolkien’s thrilling fantasy classic comes to life in this brilliantly animated tale of the enchanted land of Middle Earth — and the brave band of hobbits, heroes and wizards who set out to protect it! When a dangerous and powerful magic Ring falls into his hands, a little hobbit named Frodo is caught up in a gigantic adventure! Now, join him, the mighty wizard Gandalf and a daring band of elves, dwarfs and warriors as they set out to defend their enchanted land from the wicked sorcerer who would destroy it. Set in a mystical age of magic, monsters and unlikely heroes on incredible journeys, The Lord of the Rings will cast its spell over your entire family!